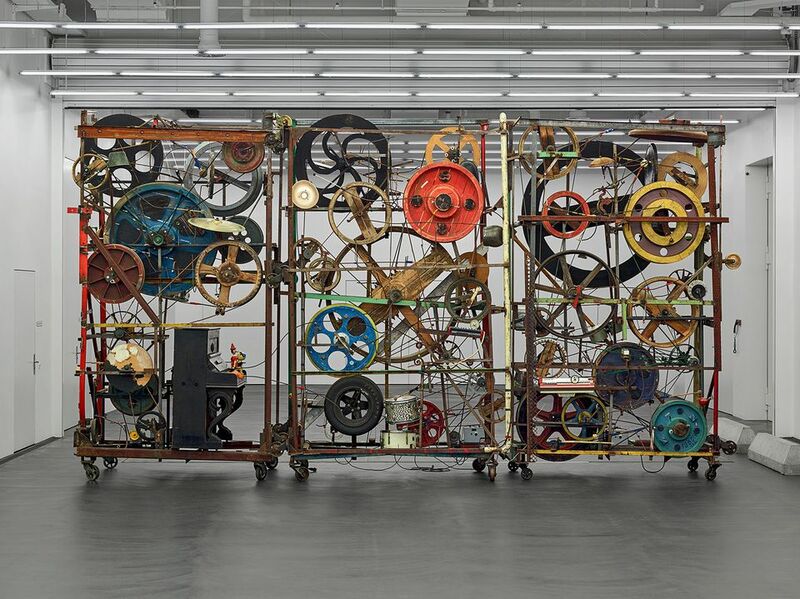 A year after it was silenced, Jean Tinguely’s beloved clanging, banging, creaking, groaning music machine Méta-Harmonie II is ready to go back into action at the Museum Tinguely in Basel following a laborious year-long restoration of many of its parts. Conceived as a kinetic sound sculpture and built by the artist with his associates in 1979, the work is one of four large-scale Méta-Harmonie machines created by Tinguely and has resided at the museum on permanent loan from the Emanuel Hoffman Foundation since 1996. Made of scrap metal and musical instruments held together by hundreds of screws, bolts, belts and springs, the work also consists of playful objects like a plastic Disney figurine and a child’s shoe. After nearly four decades in operation, many of the work’s mechanical and musical elements had ceased to function partly or altogether because of wear and tear, says Marcus Broecker, the senior curator at the Shaulager Museum in Basel, who oversaw the restoration in collaboration with his Schaulager colleague Carole Maître and Jean-Marc Gaillard, a conservator at the Museum Tinguely and former assistant to the artist. The original keys of the piano incorporated into the work could no longer be played, strings were torn, and hammers were broken, Broecker says, and the constant friction between metal parts moving against each other had caused serious abrasion of many components. The Disney figurine of one of Donald Duck’s nephews, which bounces on the keyboard of the piano, had grown brittle and was torn in several places. Tinguely died in 1991 at age 66. Hoping to restore Méta-Harmonie II as closely as possible to its original state, the team conducted interviews with former assistants of the artist, art historians and musicologists about the work and dug into archives, retrieving photographs from when it was made and first exhibited. An audio recording from a presentation of the work in 1982 at the Tate in London provided guidance on the work’s original sounds, Broecker says. A synthetic resin developed in collaboration with the Swiss Federal Laboratories for Materials Science and Technology was crucial to the effort, applied to the surface of components to make them more durable without altering the aesthetic appearance of the work. The team also restored and preserved various coloured adhesive tapes that connect percussion sticks with percussion levers where possible, and hand-made some of their own. The Disney figurine could not be stabilised and had to be replaced. “Now the sculpture can again be admired in its full kinetic and acoustic magnificence,” the Schaulager and the Museum Tinguely say in a statement. Unveiled today (15 November) at the Schaulager amid the machine’s colossal din, Méta-Harmonie II will recommence its clanking performances at the Museum Tinguely on 24 November.